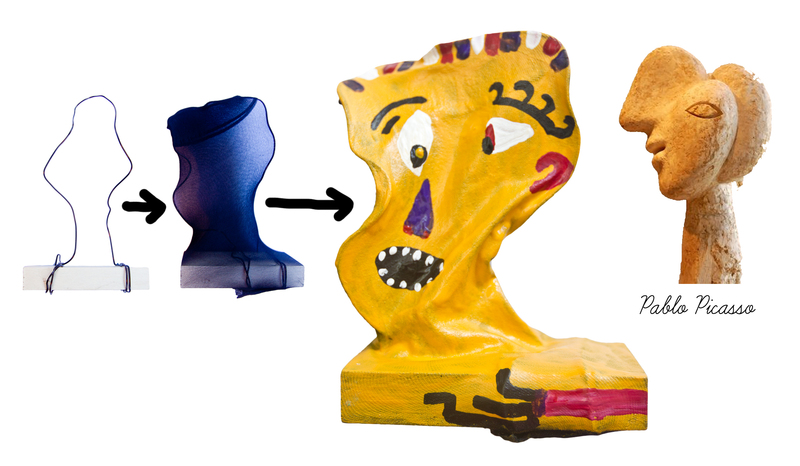 Ever since I heard about the wire + stocking sculpture, I wanted to try it – what what better way to introduce this unique medium than combining it with self-portrait lesson dedicated to Pablo Picasso. These statues are pretty simple to make (especially for grades 2 and up) but they take a long time to dry. I used acrylic paint and still needed several coats. I’d recommend doing this if you have enough time to let it dry for couple of days before decorating it. Other than that – super fun way to introduce form, discussion about face, proportions and Cubism! If you want to see more ideas about Cubism, Pablo Picasso and self-portraits, click here. This entry was posted in Art Projects and tagged art, ArTree, cubism, docent, form, head, kids, picasso, portrait, school, sculpture, stocking, wire. Bookmark the permalink.